This wonderful collection guides you through every step, demonstrating all the basics needed to master this delicious cuisine. There are more than 70 recipes for salads, curries, stir-fries, fried, steamed, and grilled foods, and desserts: such luscious meals as Tom Yam soup, fish cakes, steamed mussels, green chicken curry, and stir-fry duck are all made tantalizingly easy. Also provided is a cross-referenced collection of 12 meal plans, from simple dinners for you and your family to exotic feasts for friends and guests. 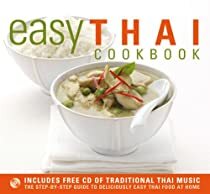 With stunning photography throughout and a CD of evocative music to cook and eat to, this is the one-stop Thai cookbook for beginners.